Eco-friendly Things to Do in New York City is bustling, beautiful and unique. Its vibrant spirit, diversity and legendary parks and buildings make it the ultimate urban tourist destination. 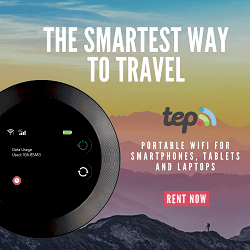 If you’re planning a visit to NYC, you should know that choosing a project Eco-Friendly will be things to do will help you to take a juicy and delicious bite out of the Big Apple, without leaving a carbon footprint. There are so many “clean and green” ways to explore and enjoy this world-class urban metropolis. 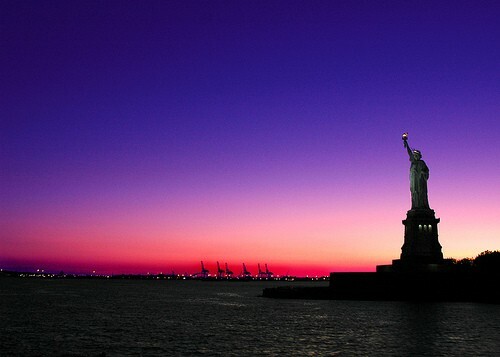 Today, we’d like to share the top 10 eco-friendly things to do in New York City. Once you’ve read about these fun activities, you may be tempted to add one, a few or all of them to your NYC itinerary. A lot of people don’t know about this exciting “hidden gem”. The Met’s rooftop garden offers one of the most impressive views of New York City. It’s possible to grab a cocktail, beer or glass of wine on the rooftop. The rooftop is adorned with art, so you’ll find that this unusual space offers incredible visual impact. Check out the view with a glass of wine in your hand and mingle with other tourists and townies. Peruse the art as you sip. It’s such a pleasant way to see the city. Also, you don’t need to have a drink unless you feel like having one. Tourists who choose this green activity give it very high marks. 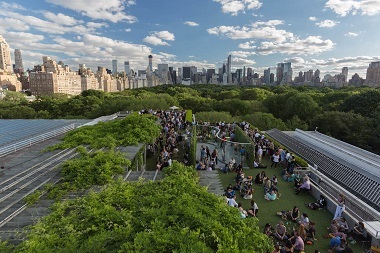 They adore the view from the roof of the Metropolitan Museum of Art, as well as the thrill of discovering an eco-conscious activity that most people don’t even know about. You’ll find the Met on 1000 5th Avenue. Once you enter the museum, ask a staff member where to find the elevator that leads to the 5th floor rooftop garden. Most people who browse the Met can’t find the elevator on their own. Have you ever been to a “living museum”? That’s what the New York Botanical Garden (NYBG) is! This Big Apple botanical garden opened in 1891 and it’s considered one of the world’s premier botanical gardens. It’s also a National Historic Landmark. When you visit, you’ll love the exquisite and extensive gardens and collections. Situated at 2900 Southern Boulevard, in the Bronx, the New York Botanical Garden is home to The Orchid Show. This annual show gives nature-loving attendees a chance to view a dazzling array of rare and exotic orchids. If you’re in the Big Apple between March 3, 2018 and April 22, 2018, The Orchid Show will be on. Checking it out will be a great way to enjoy the beauty of Mother Nature while you’re in the city. If the show won’t be on while you’re there, don’t fret. There is so much to see and do at NYBG. Stroll the Azalea Garden, take a Conservatory Tour and explore the Perennial Garden. Relax and get inspired as you drink in the natural beauty that is all around you. Javits Center is a huge convention center which covers 760,000 square feet. When you visit this “marketplace of the world”, you’ll be able to tour the Javits Center Green Roof. The convention center offers free tours to interested parties during its “tour season”, which is already in swing for 2018. You may register for your tour online at the official Javits Center website. So, why take this eco-friendly tour? Well, it’s amazing on top of Javits Center! The green roof measures 6.75 acres. Seventeen species of birds call the rooftop home and there are also three hundred thousand honeybees. This green roof is now a sanctuary for regional wildlife. The green roof reduces the consumption of energy throughout Javit Center. Be sure to check out this incredible and environmentally-responsible attraction, which is situated on Manhattan’s West Side. A tour won’t cost any money and it will be memorable. You’ll find the convention center at 655 West 34th Street. This farmer’s market features exceptional produce. 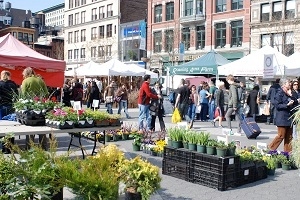 Founded in 1976, the Union Square Greenmarket has grown so much over the decades. Today, one hundred and forty fishers, bakers and farmers sell what they produce at the green market. They offer healthy fare to plenty of townies and tourists. This market is a wonderful place to roam. You’ll find the very best veggies, fruit, artisan meats, maple syrup, ciders and farmstead cheeses. This just scratches the surface. The best way to discover everything that Union Square Greenmarket has to offer is to visit the market while you’re in New York City. 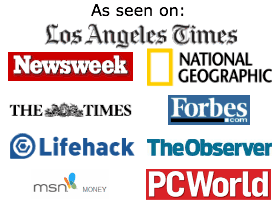 This popular market is a great place to people-watch. If you’re lucky, you may drop by when a famous Big Apple chef is doing a demo. Find the Union Square Greenmarket at E 17th St & Union Square W.
If you want the freedom to explore and you don’t want to pollute the environment by taking a cab or renting a car, be sure to consider CitiBikes Bike Share. 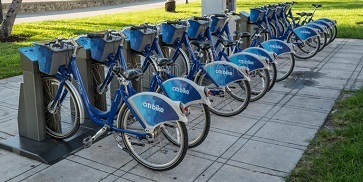 Citi Bike is a service which allows NYC tourists and residents to pick up bikes at hundreds of different stations around the city (Queens, Manhattan, Jersey City and Brooklyn). You may purchase an affordable day pass and then enjoy as many brief rides (thirty minutes or less) as you wish to on that day. Big Apple residents go for annual memberships. Once your ride is complete, return your bike to any of the myriad Citi Bikes stations. Slide it into an empty dock and then look for the green light. The green light means that the bike is securely locked. This practical, eco-conscious system is convenient and cost-effective. This linear park, rail trail and greenway are elevated. The High Line is 1.45 miles in length. It’s constructed on top of a former secondary railroad track, on Manhattan’s West Side. Trains travelled the track from 1934 onwards. These, days, five million visitors enjoy The High Line each year. It was completed during 2009. The design of this “green” Big Apple attraction is the work of Piet Oudolf, Diller Scofidio & Renfro and James Corner Field Operations. 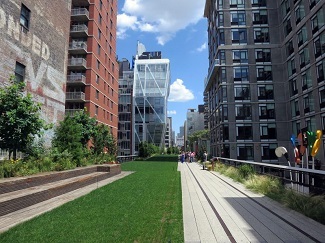 There are three High Line sections which are self-seeded public landscapes. You’ll love the shrubs, trees, perennials and grasses that you find at the High Line, as well as the inventiveness of this urban transformation project, which has turned a non-used railroad trestle into a gorgeous green space. Brooklyn Grange Rooftop Farm is well worth a visit. It features gardens which were planted on unused Big Apple rooftops. Plenty of healthy and delicious food is grown at Brooklyn Grange! The team at Brooklyn Grange LLC has put so much hard work and creativity into this impressive project. Located at 37-18 Northern Blvd, Long Island City, this rooftop farm offers guided tours and Open House days. There are also special events, including Monday Night Yoga and Farm Dinners. If you want to be inspired by the green mindset of eco-conscious NYC residents, be sure to visit this farm in the sky. It opens to the public each year in May. If you’re still deciding on New York City Accommodations, be sure to consider 1 Hotel Central Park. 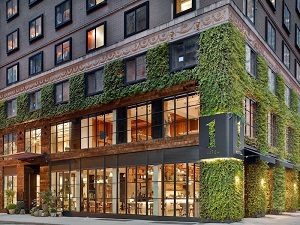 This hotel is just steps from Central Park, at 1414 Avenue of the Americas. It’s a serene and attractive sanctuary which is right in busy Manhattan! The eco-friendly appeal of this hotel, which features reclaimed wood, real plants and a host of exquisite natural touches, makes it very popular with eco-conscious tourists. It also features an onsite restaurant with farm-to-table cuisine. This hotel is beautiful, thanks to its rustic design elements and “green” aesthetic. It’s a gorgeous place to be and so close to the wonders of Central Park. If you prefer pure and healthy food and wine, you’ll adore Le Botaniste. This food and wine bar is located at 833 Lexington Avenue and it offers plant-based, organic fare. 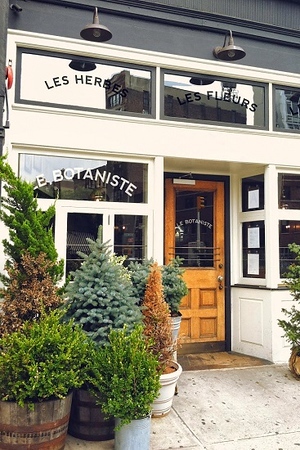 The owners of Le Botaniste are committed to eco-friendly business practices which benefit human health…as well as the planet! Examples of delightful food to sample at this popular and unique Big Apple eatery include Red Beet Caviar, Dirty Noodle Soup and Omega 3 Brownies. Enjoy a glass of organic wine with your meal or go for Detox Juice (or another non-alcoholic beverage). Last, not definitely not least, we strongly encourage you to enjoy a pedicab guided tour of Central Park. Pedicabs are rickshaws and they don’t pollute the environment. They are so comfortable for passengers, thanks to their padded backseats, and they are the perfect “green” way to enjoy Central Park. When you book through a great company, you’ll be matched with a rickshaw operator who knows so many fun facts about the park and its attractions and history. There is even a Gossip Girl Pedicab Tour, which is ideal for fans of this glossy and juicy prime time soap. 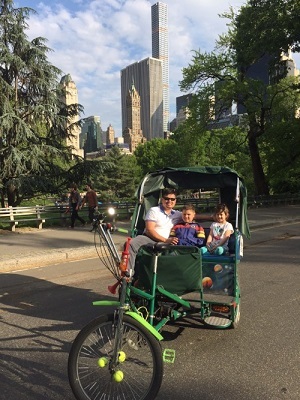 Central Park Pedicab Tours are quite affordable and one and two-hour tours are available. 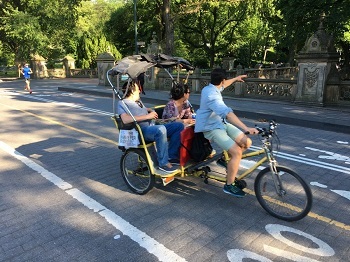 In a pedicab, you’ll be able to sit back and relax as you drink in the splendor of Central Park. Get creative with a children’s literature trip through New York. Whether you are visiting the Big Apple with the kids – or you are just a fan of children’s literature. There is a treasure trove of landmarks around the city that will be familiar to fans of beloved stories. From spunky girl heroines “Olivia” and “Eloise” to lesser known, but no less delightful, characters like “Knuffle Bunny” and “Mrs. Basil E. Frankweiler,” in between your visits to the Empire State Building and Rockefeller Center, you can squeeze in a few landmarks immortalized in favorite childhood stories. Perhaps one of the most beloved – and obvious – literary landmarks in New York is the Alice in Wonderland statue, located at East 74th Street north of the Water Conservatory in Central Park. At more than 11 feet tall, this statue immortalizes everyone’s favorite dreamer in bronze; Alice sits on a large mushroom, surrounded by the White Rabbit, Cheshire Cat, Dormouse and Mad Hatter. It’s one of the few public art sculptures that actually encourage children to climb on it and interact with it. While there are many things to do while you are in New York, no trip would be complete without paying a visit to the Plaza Hotel – particularly the Eloise at the Plaza Shops. An homage to the rambunctious Eloise, the hotel’s youngest resident, the predominantly pink shop allows Eloise fans to enjoy a tea party, model their favorite fashions from the stories and immerse themselves into the experiences and atmosphere of the popular books and movies. Of course, for the true Eloise experience, splurge for a night in a room at the Plaza. The Met has featured prominently in a number of literary works. In the book, siblings Claudia and Jamie Kincaid run away from home to live in the museum, where they sleep in an antique bed, collect coins from the wishing fountain to buy food and embark on a mysterious quest to find the name of an anonymous sculptor. While some of the exhibits and features from the book were either made up, or have since been changed, for fans of the book, a visit to the museum is a welcome opportunity to see exactly where the Kincaid’s had their adventures. Another fan of the Met is “Olivia,” the precocious young pig from the series of the same name. While the author has never confirmed that Olivia is in fact a New Yorker, many of the real-life artworks that appear in the books are part of the Met’s collection. Take the kids to see works by Renoir and Pollack. And remind them of where they first saw the paintings. In “A Cricket in Times Square,” a cricket named Chester is the star. He comes to the famed neighborhood from Connecticut and becomes a musical superstar. While you might be hard pressed to find a cricket there today – or hear one over the noise of the traffic – it’s still worth a visit to Times Square. The original story refers to the Times Square of 1960 which has changed significantly since then, but the kids will love visiting the immense Toy R Us store (and riding the ferris wheel inside) and taking in all of the sights and sounds of the crossroads of America. Fans of Mo Willems’ popular books will remember the toddler Trixie and her stuffed animal Knuffle Bunny. Read “Knuffle Bunny: A Cautionary Tale” and “Knuffle Bunny Too” and recognize the setting in Brooklyn’s Park Slope neighborhood. Explore this trendy neighborhood with its coffee shops, cafes and galleries, and look for landmarks from the stories. Planning a children’s literature trip through New York will be fun for all ages. Take some time before you go to revisit some of the favorite stories of your child. Seeing some of the landmarks like Central Park and monuments will bring the stories to life. It will also create some new memories for the entire family.